Miles and Rafi are two founders in the current YC batch who just launched their new startup, MTailor. 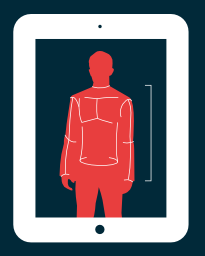 It's a iPhone and iPad app that lets you get accurate measurements of your body so you can order made-to-measure dress shirts that fit you perfectly. You put the iPhone or iPad on the floor at an angle, and the app walks you through the 30 second process of turning around in place in front of the front-facing camera. The amazing thing is that the entire process is 20% more accurate than what a professional tailor would do in person. That's pretty damn cool. The founders are Stanford CS and math grads and devised and perfected the computer vision algorithms themselves. In the past similar founders would have tried to find some way to license the tech, but MTailor is building a new brand from scratch. It's an ambitious way for the company to fully create as much value as possible without middlemen and enterprise sales. Mass customization is finally hitting the mainstream, thanks to software. In the past it has always been difficult and time consuming for clothing to be made with specific measurements. It was a tedious process to begin with since it was hard for people to get accurate measurements, and even experienced tailors have trouble getting it right. Add a whole lot of waiting to the mix too — it'd take six weeks or more to wait for a shirt to be made. Those two problems taken together reduce demand. And as a result, the cost goes up, even further reducing demand. That's where a new software capability can come in, like MTailor's computer vision algorithms, and radically change the equation. Since it's easy to measure yourself, the major stumbling block is removed. And with a steady stream of orders, they can bring the price and wait down. That's exactly what the team has done, coming in at the $69 price point and a 2 week lead time. I was once a die-hard made-to-measure Indochino dress shirt fan, but I know where all my future purchases are coming from. That's the power of better, cheaper, faster, and how software eats the giant apparel business. Keep an eye on MTailor and try download their app. It's available right now.